Slade House if a difficult place to find, seemingly only accessible by a small black door off an alleyway in a nondescript suburban housing estate. This book tells the story of some of the unlucky people who manage to find the house and encounter its inhabitants. 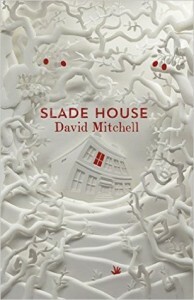 This short novel is a companion-piece to Mitchell's "The Bone Clocks" which I read last year, unlike that book which mixed a number of different genres this sticks to a single genre, in this case a haunted house story told through the tales of five people who encounter the house and its malevolent inhabitants over the course of four decades. I thought "The Bone Clocks" biggest weakness was that the supernatural fantasy elements of the story felt a bit out-of-place compared to some of the other plotlines and the more mundane plotlines tended to be better. In this book I thought the supernatural elements of the story worked a lot better, probably due to being more integral to the whole story. It's a fairly short novel but I think it's about the right length, any longer and it might have risked getting repetitive. I think Mitchell's characterisation is one of his strengths and I think it works very well here, he does have a knack for making characters seem interesting and well-rounded in a short space of time. I think this would work well as a stand-alone but the little references to Mitchell's previous work do add something, particularly in the final section where there's probably a completely different reading experience if you recognise the name of one of the characters.